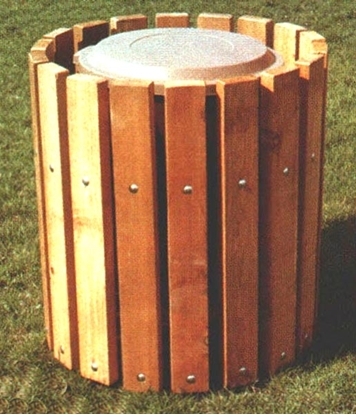 Wooden Trash Receptacles offer a natural look for many parks and areas where Wooden Trash Receptacles are appropriate. Wooden Trash Receptacles fit well for both outdoor and indoor use. Use wood trash receptacles to match our Shorea benches and planters for complete natural areas. 22 Gallon Slatted Oak Wood Trash Can - Black Powder Coated Frame - Portable, Inground, or Surface Mount, 55 lbs. Park Tables offers a variety of outdoor commercial wooden furniture such as wooden picnic tables, wooden benches, and wooden trash cans. Many of our outdoor wooden site amenities can be matched for a complete and natural appearance. Call our friendly staff for a quote on outdoor wooden picnic furniture from Park Tables.